Preventive Care: The Best Long-Term Solution! Everybody knows that at-home care is essential for protecting your oral health in between visits. Unfortunately, many people assume that because they practice at-home care, they don’t need to visit the dentist regularly or even at all. They may also skip visits because they don’t see a reason to go if there are no obvious problems present. The fact is preventive care like exams and cleanings from Dr. Nossa don’t just help your mouth feel incredibly clean afterwards. They’re also meant to clean the areas you can’t reach at home and catch disease you can’t see with the untrained eye. To schedule your next appointment and learn more about the importance of preventive care, contact our office today! Dentists are mainly on the lookout for tooth decay and gum disease because they are the most common issues that appear. However, preventive visits aren’t only intended to catch these issues alone. 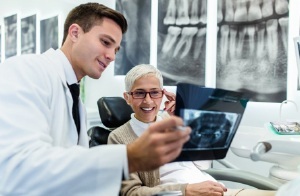 In a world where oral cancer is on the rise, dentists are remaining extremely vigilant in their search for this deadly condition. In many cases the person diagnosed does not exhibit any risk factors, but with a dentist’s trained eye and advanced technology, he can easily determine if oral cancer is present. Dental cleanings work to protect the many areas of your mouth that often get missed at home. This is likely because you don’t have the tools nor skills to reach the deep pockets in between teeth or the hard-to-reach areas of your mouth. Additionally, if you want to avoid gum disease, regularly cleanings are essential no matter how well you brush at home. He’ll also examine your neck, jaw and the way that your bite comes together. Misaligned bites have significant implications if left untreated and oral cancer can easily manifest in the throat and neck, so these structures are crucial to examine. He may also perform X-rays if you are due for them, or if you provide symptoms that call for a closer look of your underlying structure. During your cleaning, a hygienist will remove stains and deposits from all the surfaces of your teeth. If you don’t floss, the edges of your teeth will likely have significant plaque to remove. With a thorough cleaning, they’ll be able to reach all the areas that over-the-counter products cannot. 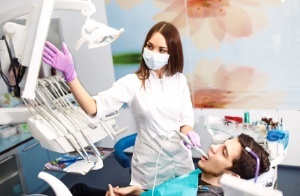 Once finished, you’ll also be able to ask any questions you have about your oral care. This could be recommendations for oral care products, ways you can improve your at-home cleaning technique or how to reduce teeth sensitivity. Don’t let your cleanings and exams go by the wayside. Contact our dentist in Gainesville and complete your oral care routine today!